A lively text and captivating images tell the story of the ever-curious boy who grew up to make one of the most significant discoveries of our time. From the time Charles Darwin was a boy, he was happiest when he was out alone collecting specimens (especially beetles). And despite his father's efforts to turn young Darwin — a poor student — into a doctor or clergyman, the born naturalist jumped instead at the chance to sail around South America, observing and collecting flora and fauna all the way. In a clear, engaging narration, Kathryn Lasky takes readers along on Darwin's journey, from his discovery of seashells on mountaintops that revealed geological changes to his observations of variations in plants and animals, suggesting that all living things are evolving over time. Matthew Trueman's striking mixed-media illustrations include actual objects found in nature, enhancing this compelling look at the man behind the bold theory that would change the way we think about the world — and ourselves. Kathryn Lasky is the award-winning author of more than ninety books for children, including JOHN MUIR: AMERICA'S FIRST ENVIRONMENTALIST; A VOICE OF HER OWN: THE STORY OF PHILLIS WHEATLEY, SLAVE POET; VISION OF BEAUTY: THE STORY OF SARAH BREEDLOVE WALKER; and INTERRUPTED JOURNEY: SAVING ENDANGERED SEA TURTLES. She lives in Cambridge, Massachusetts. Matthew Trueman spent his childhood in Italy but returned to the United States to attend art school. He is the illustrator of A PICTURE FOR MARC and NOAH'S MITTENS. He lives in Phillipsburg, New Jersey. Of ONE BEETLE TOO MANY, he says: "The illustrations in this book started out as drawings created with acrylic inks, watercolor, and graphite pencil. I moved up the food chain to add gouache and colored pencil. After sealing the pictures with acrylic medium, I did my thicker acrylic painting, then fooled around a little more with graphite and colored pencil. Finally, I added the collage elements, including paper, string, and weeds and wildflowers from my yard and nearby ditches and fields." Large and humorous mixed-media illustrations will draw children to this large-format biography…Lasky's text balances the exuberant artwork with well-organized information, gracefully sprinkling in quotes from Darwin's own writing…creates a clear view of a man who was troubled by the implications of his observations and who, at the end of his life, was more interested in experimenting with earthworms and carnivorous plants than in promoting his theory. Distilling tough concepts into light, conversational prose…a just-right introduction to Charles Darwin….colorful, cut-to-the-chase language …multilayered mixed-media illustrations; mostly paint, these also incorporate bits of flowers and weeds as well as string, paper and fabric. This accessible jaunt will easily situate the man as a natural adventurer in kids’ minds before he becomes just another stuffy old scientist. An accessible presentation that’s likely to circulate briskly. This well-rounded look at Darwin is enhanced by the illustrations, which add a touch of whimsy to the pages. Darwin’s various adventures are broken up in ways that allow the reader to repeatedly enjoy pieces and parts of this title, possibly as a read-aloud. Trueman’s illustrations are fun and winsome; no dry scientific sketches here. This intelligently and elegantly designed volume makes clear how much Darwin's ideas continue to create an impact on science, society and culture, a century and a half later. Emphasize[s] Darwin’s ‘extraordinary adventures,’ the fun, the pleasure he took in observing wherever he was. Colorful details about the great scientist bring him to life in full living color in this marvelous picture biography. The text is full of small details that will grab the attention of young readers…Trueman uses his mixed mediums to great effect, and the addition of pressed flowers and plants to his already delightful paintings is especially effective. Packed with tales of [Darwin’s] adventures, his ideas, and his work…well written and factually correct and contains absolutely beautiful artwork that is both whimsical and appealing. Brilliantly illuminates the life of the famed naturalist Charles Darwin. Works well to display Darwin s personality and the excitement of his forays into the natural world. The illustrations are a match to this approach and the style of the writing, with a slight air of the whimsical and lively, colorful immediacy. Kathryn Lasky brilliantly illuminates the life of the famed naturalist Charles Darwin who gave birth to the ‘idea that scared the world…Matthew Trueman’s charming and intricate illustrations…convey the contradictions and humanity of Darwin. Distills an enormous amount of difficult information into just enough text for young readers…Artist Trueman adds fun to the mix with large mixed media cartoon illustrations that appropriately incorporate bits of plants flowers and weeds…entertaining and friendly. Skillfully blending watercolors, pencils, and inks, the art captures Darwin’s fascination with life around him, making this a compelling introduction to this important scientist’s life. 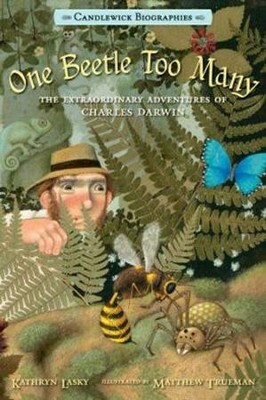 I'm the author/artist and I want to review One Beetle Too Many: The Extraordinary Adventures of Charles Darwin.